No doubt that’s where you likely find yourself right now. And that’s awesome; you’ve picked a great time to make the same foray, as 2018 is set to be an absolute rollercoaster for the whole crypto ecosystem. To cut through the volatility and wildness, you’ll need to have various sources of news and educational materials that you can rely on and trust to steer you true. To this end, We want to help you “bookmark” the best resources possible. We’ll break it all down for you. We had to give ourselves a shoutout first! Sincerely, though, we’re well-placed here. Let us explain. Blockonomi caters toward educating our readers. The cryptocurrency space can be incredibly dense to newcomers and novices alike, but anyone can definitely get achieve the level of understanding they desire with a little daily catching up. That’s where we at Blockonomi come in. 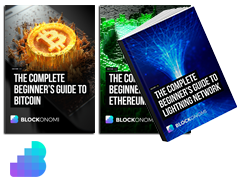 We write guides and news features so readers can stay constantly up-to-date in the increasingly booming cryptocurrency craze. We are currently hiring more writers and will make the move into the daily news space at some point in 2018 when we decide we will be able to maintain a good balance between educational posts and breaking news. So if you’re looking for a great starting point to dive into the crypto space, we’re ecstatic to help. Then there’s Bitcoin.com. By pure site visitors, Bitcoin.com appears to be the undisputed champion of crypto news sites, bringing in millions of viewers daily. The domain name certainly helps with that, but the page has been around for years and has always been good at scooping adoption and regulation stories for the community. This site is ran by Roger Ver, the early Bitcoin evangelist who’s now one of the main community leaders behind the recently forked Bitcoin Cash (BCH). And, since the legacy Bitcoin and BCH communities have been trading PR blows and swipes on social media as of late, the two sides have become further polarized and entrenched, leading Ver to direct Bitcoin.com toward a not-so-subtle BCH bias in its news reporting. Now BCH is an interesting project, to be sure. The Bitcoin community in general will undoubtedly require both on-chain and off-chain solutions no matter how grumpy that makes either side, and Bitcoin Cash is angling after the “on-chain” of these solutions in a noteworthy way. Accordingly, it’s just worth pointing out that Bitcoin.com is a “BCH site,” as it were, when it comes down to it. But don’t let that stop you from checking out the headlines there. As mentioned previously, Bitcoin.com is always breaking global crypto news just as fast as anyone else in most cases. In the free market, everyone’s entitled to their opinions. It just helps to be aware of what those opinions are. Cointelegraph is a huge Bitcoin-centric news portal which covers breaking news and publishes a high volume of content each day. It employs a large team of writers and also is available to read in Spanish, Brazilian, Serbian and Japanese. Their news articles stand out by the fact they publish a custom illustration with each article they write so you will have noticed them on your Twitter feed quite regularly. CCN.com just recently re-branded and changed domains from Cryptocoinsnews.com and is one of the larger news blogs about Bitcoin and Cryptocurrencies. It started life back in 2013 and has grown to be a successful site serving over 100,000 unique visitors per day with good mix of news, reports and features. It is the partner site of Hacked.com which gives trading tips and delves more into ICOs and gives investment advice for a membership fee. TheMerkle is another news blog which was founded in 2014 and offers a mix of informational posts, sponsored posts and breaking news pieces. It has a smaller team of 4 people who managed to post around 20 posts per day, which are typically shorter in length than other similar sites. Bitcoinist despite the name focuses on most aspects of the Cryptocurrency world and publishes a good volume of content each day and has a large readership. The standard of writing is high and they have some interesting information posts also. Their content tends to be shorter in length but they do cover most of the breaking stories so they’re a good one to add to your feed reader / Twitter account for up to date news. Mainstream outlets haven’t been covering cryptocurrency that much until just recently. Two excellent mainstream sources that have been leading the pack, however, are CNBC and Forbes. Indeed, these outlets are pumping out crypto-based content out as of late, showing that they’re turning their attention to the space in a decisive way. And in this light, they bring the reputational journalistic integrity to the ecosystem in way that only large media firms can bring. Reddit is where users come together on “subs” to share news, have conversations, engage in debates. All that good stuff. On Reddit, then, you have very decentralized and compartmentalized communities that constantly circulate breaking news. So, say, if the Ripple (XRP) price is surging, you can go to /r/Ripple see a slew of headlines posted by users that might explain, or partially explain, the said bull run. Now multiply that scenario across every cryptocurrency project and its associated subreddit, and you’ve got a ton of fantastic news and tools at your fingertips. Just like we mentioned with Bitcoin.com earlier, though, you’ll need to understand that each subreddit is naturally biased in favor of their own project. So /r/ethtrader users aren’t big fans of Litecoin. The /r/Bitcoin and the pro-BCH /r/btc communities hate each other. You know, the typical tribalism you seen in any field of human interest. So just read around to get a fuller picture; don’t take the views expressed on a single subreddit as the end-all-be-all. When it comes to YouTube, there’s two fellows you should definitely follow: Boxmining and Ivan on Tech. Both of these channels are excellent, informative, unbiased, and regularly productive (in the content sense). Boxmining, also known by his name real name Michael, covers cryptocurrency news, reviews, and price analyses everyday. And his insider connections in China give him unparalleled insight into the regulatory atmosphere there. Ivan on Tech, or Ivan, is a programmer by day, so he uses his programming knowledge to help explain the cryptocurrency ecosystem in a way that’s easily understandable and extremely insightful. Subscribe to their channels, and you won’t be disappointed. Michael on the left, Ivan on the right – Image via YouTube. And even cooler? The two pundits do livestreams together periodically. Check out this brand new one they just hosted. The cryptocurrency arena is extremely news-driven at present. Until boatloads of institutional money stabilizes these coin prices, a bad or good story can send prices shooting up or down. At the fact of the matter is that many Twitter accounts are “creating” news right now. For example, Ethereum creator Vitalik Buterin recently hailed OmiseGo (OMG) as his favorite kind of token model on Twitter. That tweet alone sent the OMG price skyrocketing acutely. There’s a lot of great personalities on the platform to follow. From citizen sleuths, to trolls who ask the right questions, to industry insiders that post routinely, you should definitely use Twitter as a pseudo-source for news (upon which you can do further research). Great article – I would love to read your suggestions of Twitter users to follow, as well! Great article. I am a webmaster and am currently looking to concatenate online sources for crypto-related news. I will keep this website and its writers in mind. Good explained News Sources, Themerkle.com and zycrypto.com are my two main sources for Crypto News and they both deliver well. Good list. cryptonewsbytes.com & ethnews are good ones as well. Good article,and a very big recommendation. Hey guys,what best coin to purchase thus year? LEDU? DASH? ETH? I really want to go for LEDU. I am a newbie when it comes to cryptocurrencies, today. But I did join some PTC sites before that pays bitcoins. Those are the times when the only popular cryptocurrencies are bitcoin, dogecoin and litecoin. I see there are a lot to choose from, nowadays. There’s lots of great news sites however its hard to find commentary that cane guide traders. Drudge report type of website but just for cryptos. Great article! We’d love for you to consider adding Sludgefeed.com to the list. We cover crypto, blockchain, and tech news – and also have a daily newsletter called Hashed that rounds up all the latest news from the past 24 hours. As an alternative New Crypto News Site https://www.Cryptocynews.com is a good one. You should look at coinpaper.ga they are currently in beta thats why they dont have a .com domainname yet. Coinpaper.ga is a coin portal where you can find almost all your crypto needs like updates , events , jobs , ratings and many more things in an easy and fast way. The special thing about this site is that it has a unique design , That makes it fast to use. This is a great list. I am looking for some reliable content resources that are credible and would provide reliable information. I wish there was some way to find out what the most popular content in crypto is at any given time as a content creator myself. Add investfeed.com to the list. We are a great source of current and trending news on all things blockchain and cryptocurrency.